Stay at one of two houses, located on a gorgeous tropical property that is just steps off the beach with two amazing surf spots in the front yard. The two houses feature various room types that are either private or shared by 2 guests. Some rooms have AC, others are fan cooled. Both houses have wifi and share the pool and other common spaces. There’s a comfortable dining and living room area where we will have our meals and do our video coaching and “classroom” sessions, and a large upstairs patio for yoga and relaxing after long surf sessions. This region in Costa Rica is regarded as one of the most biologically diverse places in the world. Expect to see monkeys, sloths, toucans, scarlet macaws and a variety of other local creatures! We’ll ride horses deep into the jungle to check out a Native Indian reserve, do a boat trip to surf (conditions permitting), and have a ladies night out on the town. We’ll even learn to make chocolate and support the indigenous community by shopping their locally made products. Most of all, we’ll relax and reconnect with nature. 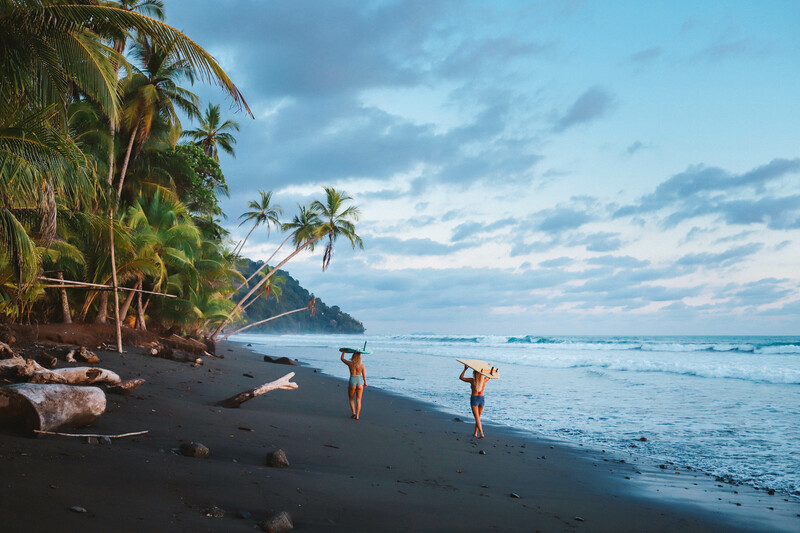 Located in the same zone as our primary southern Costa Rica location, this option is situated right in front an awesome sand-bottom beginner break that’s also incredibly fun for working on nose rides, cross-steps and other intermediate and advanced longboard skills. There’s a world class super long left point break within walking distance. If the swell is too small for the point we’ll drive to surf a couple of other waves just down the coast. We’ll take a boat trip across the gulf to surf a right point break one day (conditions permitting). We typically break up the group by ability so that everyone gets what they’re looking for and we don’t show up anywhere with a big crowd! To book your flight, first fly into San Jose, Costa Rica (SJO), then connect to a domestic flight to Golfito. I recommend looking at the possible international options but then actually booking your Golfito flight before booking your international flight. I was told by an Amiga who has already booked hers that it looked like all the flights shown below on the schedule were available until she actually tried to book one of them. So book the smaller flight first just to be sure! There are several flights per day into Golfito – an early morning, a midday, and a later afternoon flight. Our shuttle will pick you up on the midday or afternoon flight only since the hotel does not allow check in before noon. For the way out, choose the early or midday flight to take advantage of our shuttle.